Description: Level: Aimed at engineers, managers, IT students and professionals, quality control engineers, product / process designers, and systems integrators, interested to learn about computer networking, the Internet and Internet server silos. Several sections and cases could be ideal for undergraduate and graduate education, and even for high school students and technicians learning/ exploring related technology. Industrial Sponsors/ Contributors include with special thanks MCI, Verizon, CIMware Ltd. UK, CIMware USA, Inc., and others. 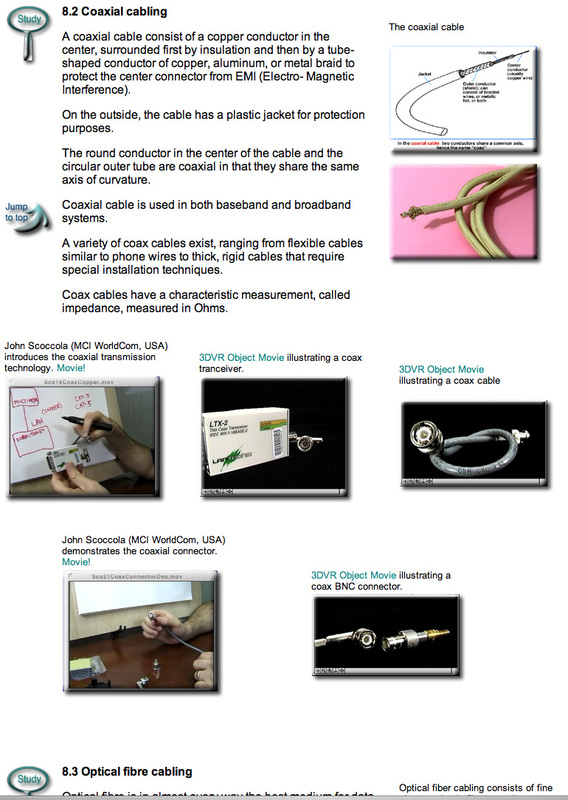 DVD Video Contents: This electronic publication is a professional quality DVD video presentation (Part 2 of 2) and facility tour by John Scoccola, NJ Telecom Director, USA. We focus on computer networking components, systems, actual examples of large Internet networks, Internet server silos, their system components, how they operate and why with in-depth practical demonstrations in one of the world's largest facility. What you will learn: Having watched the DVD video, you will be able to understand the key aspects of computer networking, the Internet and Internet server silos. You will also see practical demonstrations of related technology in engineering and IT. DVD Video System Requirements: DVD-ROM: NTSC standard definition (SD) DVD video player for TV, or computer. Approximate length 22 minutes, in 4:3 regular screen format, or any good computer screen (min. 800 x 600 resolution). Also available in PAL, as well as for the Video iPod. Please visit www.cimwareukandusa.com for available formats and further products. 3D eBook Contents: (Written by Professor Paul G. Ranky, with John Scoccola). This publication, tested on many undergraduate and graduate students and professionals in the USA, Europe and in Asia, is an excellent introduction to computer networking and te Internet. It discusses the basic methods, tools, technologies, and international standards, with several industrial and research case studies demonstrated by academic and industry experts in real world settings, and using interactive 3D technology. The over 700 interactive screens include over 40 digital videos and highly interactive 3DVR objects, covering: Introduction to Networking; Computer Controlled Machines and Systems Integrated by Networks; Communication and Electronic Data Interchange (EDI); Integrated Design, Manufacturing & Networking; Networked Total Quality; Principles of Distributed Processing; Computer Network Classification; Transmission Medium; Topologies; Access Control Methods and Solutions; Network Architectures; Network Reference Models; Internet Networking Solutions; Wireless Internet; The World-Wide-Web; Data Communication Services; Real-time Networking Using Fieldbus / Profibus Technology; Network Planning and Technology Management; Network Simulation using OPNET Technology; Case-based learning and marketing methods; Major Review Questions & Problems; References & Further Reading; Case Documentation Guidelines; Useful Spreadsheet Templates for Educators and Students; A Major Glossary of Networking and Internet Terms; Customizable, Open-source MS-Excel Tools & Templates to Perform Your Own Calculations. Optional professional quality DVD video (also in PAL, or NTSC, and the Video iPod format), covering computer networking and the Internet is available. For other packaging combinations, and related modules please visit our electronic library at www.cimwareukandusa.com.